Actor, Sanjay Dutt surrendered to serve three and a half years in arms case and cricketer,Sreesanth , got arrested for being involved in IPL betting. 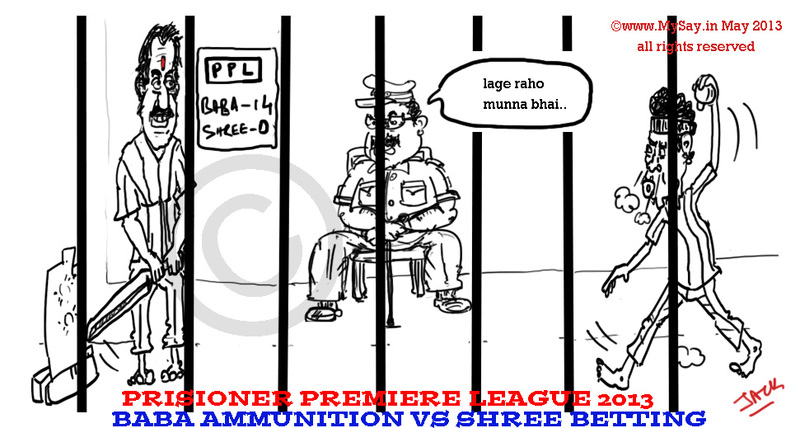 Soon we may have another T20 tournament inside the prison – Prisoners Premiere League ! better name it Indian Prisoners League so that it will also get some sponsers and they can also have the after release parties(if they are released)!!! Hahahah 😀 😀 I love your whole contemporary outlook through your cartoons 🙂 awesome!! 🙂 thank u dear Richa ! Ha ha ha.Who knows, this may happen one day. heheehe imaginations may turn to reality sir !! here also Sree is faring badly…another splendid Doodle…!!! I appreciate the way you find out current affairs to create lovely cartoons that really make us laugh. Thanks for sharing, this is too good! Mysay .. i am laughing while i write this ! it was funny indeed ! lovely doodle and concept ! you rock !! That’s a lethal one…hee heee…. 😀 thank u thank u !! 😀 This is funny indeed! & Lalit Modi will bet on this fixed match too….!!! It will be Sanju’s underworld connections vs Sreesanth’s bookie connections. A tough match. thanks Cynthia 🙂 Thanks for dropping by ! all your comments were going in spam !! thank fully i got one of the readers complaining about the same and could retrieve these valuable comments !!! 🙂 thank you ! thanks dear !! Where have u been ?long time no See ? Hmm! Wishing a very Happy birthday dear friend … may prosperity,contentment and love prevail throughout !! Yeh Lo! How about Munnabhai Jailse? Great blog I loved it very much. Cartoons are mindboggling. thanks Jeetendra 🙂 I appreciate your compliments . food for betterment of work !! Your name is Narendra (Am I right?)….. You are really very creative….nice one! then may I know your name? I am really not sure why the dailies are not chasing you by now! They are losing out much if they have not yet dedicated a space for your very own humorous takes on everyday issues and affairs. Wish I could tell u how much these doodles missed u ..
Alls well at your end ? Thank u so very much for dropping by and adding on to my confidence.